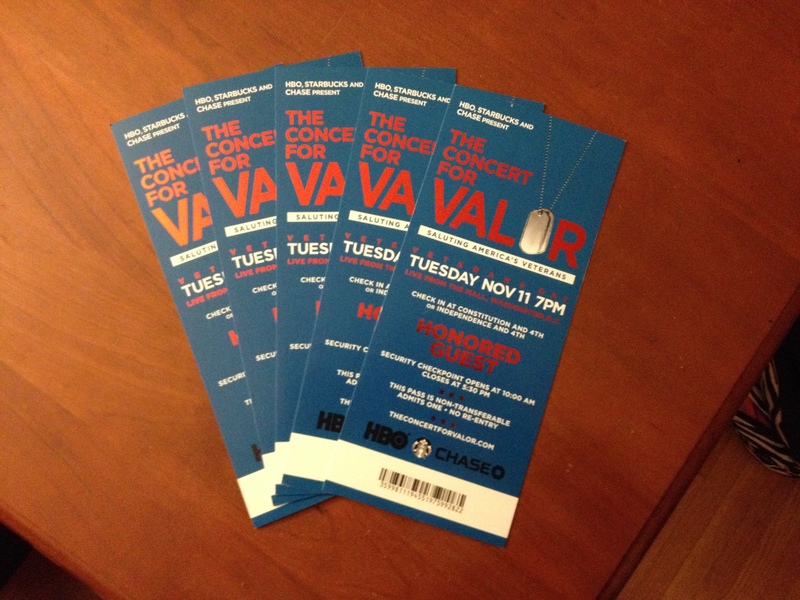 Recently, my husband scored tickets to the concert of the century: The Vetaran’s Day Concert for Valor in Washington DC. Bruce Springsteen! Dave Grohl! That British guy from the Daily Show! 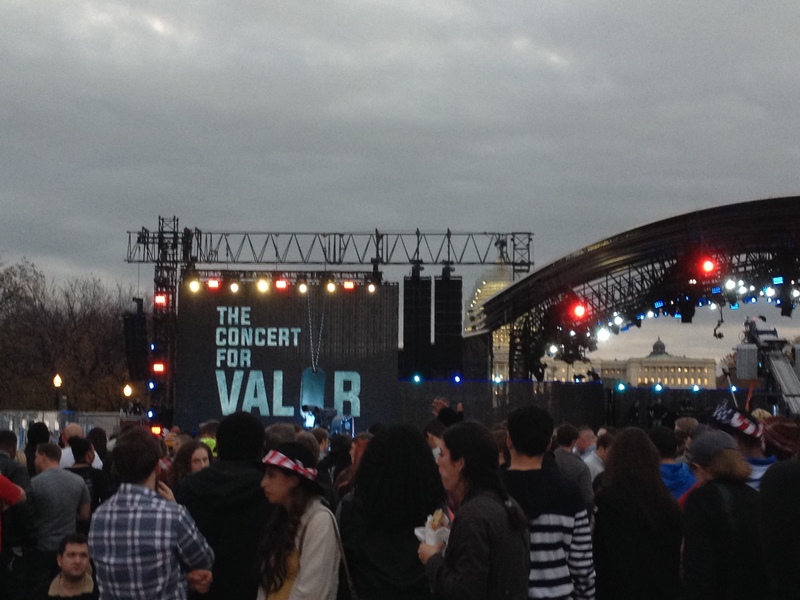 Freedom may not be free, but sometimes concert tickets are, and the best way to honor our veterans might involve rocking out to Metallica. Plus, it sounded way more fun that our usual Veterans’ Day activity of watching people visit military graveyards on TV. Even the most militant anti-American Islamist extremist would be hard pressed to turn down tickets to see Bruce Springsteen for 0 dollars. In fact, that would be a pretty effective anti-terrorism strategy. We were giddy with excitement. But, then began to wonder, should we bring the children? Like all good parents, we did some research to inform our decision: Was it free? Yes. Was food allowed? Yes. Would we have to find and pay a baby-sitter exorbitant amounts if the children stayed home? Yes. Decision made. As veteran parents, we knew this was a high-risk operation. The problem with this maneuver was the timing. Any evening event with children carries the distinct possibility of crankiness, hunger, and frequent complaints about pain in various body parts (feet, tummy, pinky finger, etc.) In addition, there was the morning after to consider. Veteran’s Day often falls mid-week. Everyone knows important holidays are celebrated either immediately on or after a weekend, to allow for three full days of revelry. Only lame holidays are celebrated mid-week, like Boss’s Day, Lyndon Baines Johnson Day (Wednesday, August 27th, in case you’re wondering) and the extremely confusing “Maundy Thursday” (pronounced “Monday Thursday”). If you’re honoring the Man, lame presidents and foot-washing, go ahead and do it Tuesday-Thursday. A holiday for Veterans deserves better, however. Once the decision was made, it was time to implement standard TTP (Tactics, Techniques and Procedures). We have summarized our experience below in order to help advise those who may undertake similar missions in the future. Preparation is key to the success of any operation. Standard-issue zip-up hoodies should be tied apron-style around waists. Lace-up sneakers are key. Heading out on a challenging family assignment is not the time for your daughter to try out her sparkly new Sketchers. We found this out the hard way, when ten minutes after leaving the car, Anna insisted on being carried on her brother’s shoulders. Luckily, she was immediately distracted by an unexpected celebrity sighting. Jack Black – that’s right, Nacho Libre himself – walked by us as we passed the reflecting pool in front of the capitol building. “I love you Jack Black!” I called out to the back of his pea coat. He raised a hand in acknowledgment. The moment provided our mutinous troops with a crucial boost in morale. I thought about the twelve thousand people inside the gates. “I don’t think we should split up,” I told him. I doubted it, but sometimes it’s just easier not to argue, especially when food is involved. And that’s when things went FUGAZI. As I flashed my blue tickets to the various security personnel, I noticed very few children, if any. I wasn’t sure if that should worry me or make me feel like the coolest mom ever. Maybe both? The mostly young-adult crowd was milling around in what seemed to be a giant holding pen. As we neared the stage, we were stopped by a beefy security guard wearing a “volunteer” yellow sash, who informed us that the gate to the area in front of the stage was now closed. Jostling now began in earnest as people tried to elbow their way up to the front to plead their case. The bottleneck grew ripe with the scents of liquor-breath, Marine sweat, and desperation as people continued to stumble and shove their way toward the gate. I can be just as determined as any drunk seaman or whored-up congressional aide, and I knew if I focused the laser-like intensity of my formidable nagging ability onto Mr. Yellow Sash, he would let us in. Oh yes, he would. But the kids were anxious. Maybe even scared. Danny’s first and Anna’s only (dear God, please) encounter with drunk Marines was going poorly. One look at their pleading eyes, and I knew what I had to do. Sighing in defeat, I grabbed their hands, turned around and unapologetically shouldered my way out. I stepped on toes. I swung my backpack like a scythe through the crowd. I kneed some unfortunate seated soul – who may or may not have been a decorated combat veteran – in the head, stomped on a blanket and kicked a smartphone. Hell hath no fury like a mother denied access to the front section of a Bruce Springsteen concert. Once we broke free from the crush, we found a strategic spot to set up camp in the back of the holding pen and hunkered down with some pita chips and Uno cards to await reinforcements. Seventeen dropped calls, two slightly hysterical messages and 7 unsent texts later, the children began to question my leadership and lack of sandwiches. I assured them the communication failure was not my fault, but after my 8th “WTFRU” text bounced back unsent, they became particularly concerned about the sorry state of our supply chain, and we decided to pack up and take the metro home. Adrift on a Coast Guard Academy blanket in a sea of drunken Springsteen fans. Thus, the next hour was spent with me calmly explaining how I had tried repeatedly to contact him, made decisions for the benefit of the children, and that by the way, he may remember that I TOLD HIM splitting up was a bad idea in the first place. After the obligatory screaming, Mayor Vincent Grey appeared on the Jumbotron to welcome the crowd, make an ill-timed bid for DC statehood, and deliver an unintentional warning about the dangers of too much botox. “What’s wrong with his face, mom?” asked Danny. So many, many things. Then, Dave Grohl took the stage, and we forgot all about our operational difficulties. We crooned along to “Here Comes My Hero,” bobbed our heads to the the Black Keys’ “Lonely Boy”, and played some mean air ukelele to the Zac Brown Band. 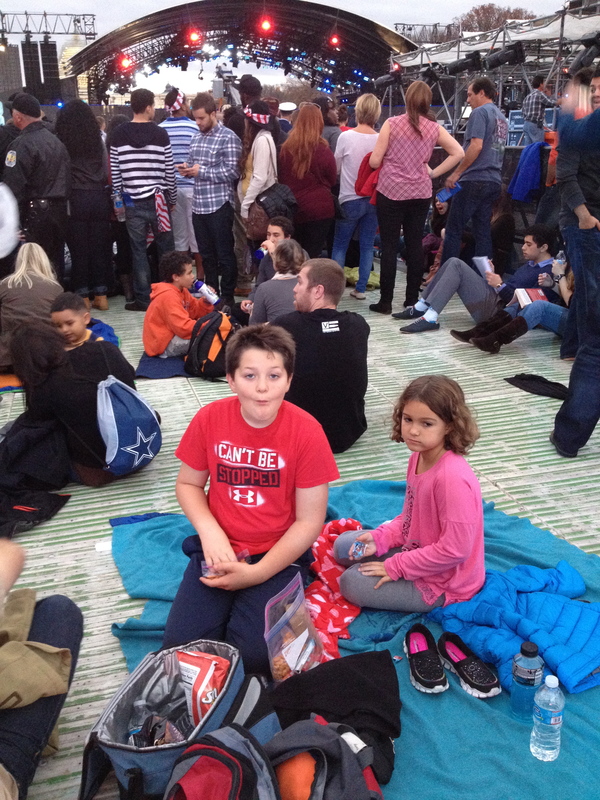 The children were riveted by the stories of bravery, heroism, and yes, valor that lit up the Jumbotron in between sets. The crowd around us watched and applauded reverently, and my 10 year old, who doesn’t cry when he gets whacked in the head with a hockey stick, teared up several times. But then, in a bowel-shaking panzer blitz of heavy metal fury that made my 42 year old husband squeal like a pre-teen at a Taylor Swift concert, Metallica took the stage. After a little shock and a LOT of awe, I knew it was time to declare victory and leave. We made our exit to the strains of Rihanna’s “Diamonds in the Sky,” skipping both the traffic and Eminem’s “f-bomb” laced performance. In our post-operation debrief, it was unanimously decided that the outing was a success, resulting in minimal losses (a few UNO cards) and a 100% increase in awareness of the awesomeness of America’s veterans and James Hetfield’s thrashing guitar. What could be more patriotic than the Metallica frontman’s incomprehensible roaring over the fruited plains of Lars Ulrich’s pounding drums? Nothing, that’s what. When I heard the opening riff to “Enter Sandman,” I was proud to be an American, and so were my kids. Awesome read! Hello to the Bader family and I hope you all have a wonderful Thanksgiving. I miss you guys! Thanks Kim! I miss you too all too! I wish you lived closer. When are you coming back to the mainland? I had a dream about a Hollingsworth/Bader reunion the other night..hopefully that is a sign that it will be soon? Or just wishful thinking? Keep ’em coming Kristi … not just for mom’s. LMAO with every post. Love reading your blog!!! Have a great Thanksgiving. Man, can you write a great story. Love it! Great job. A fun read, even the 2nd time around!!! Kudos!! !